My neighborhood is launching a new series of events, Uptown Saturday Nights, and it’s proving to be a great way to explore the area! 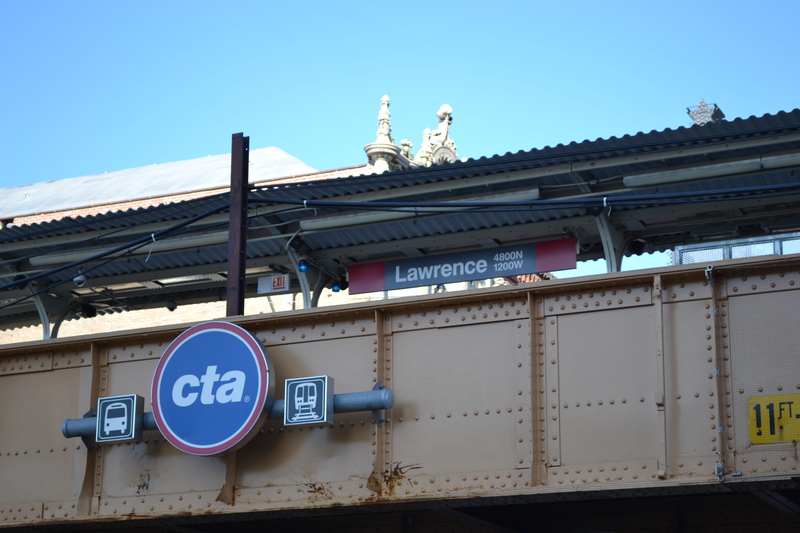 Yesterday, we checked out a free walking tour to learn a little bit more about Uptown’s history. 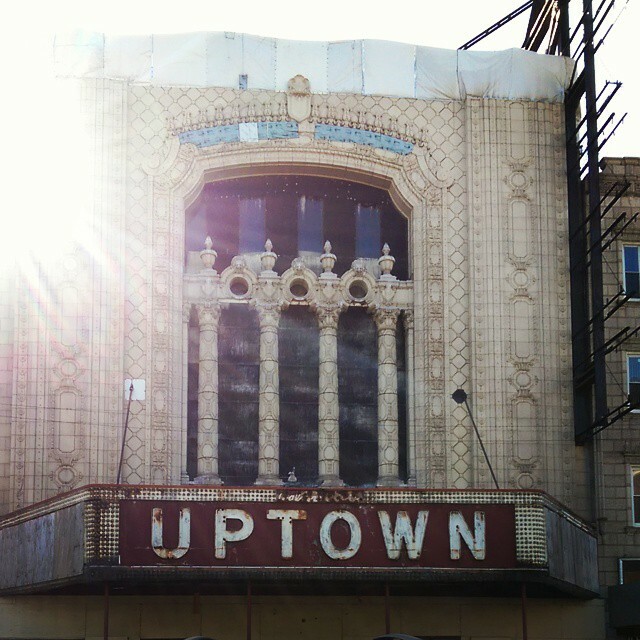 I already know Uptown has a rich entertainment history, with the Green Mill, Aragon, Uptown Theater and the Riviera. But I didn’t realize that history extended to Hollywood. Charlie Chaplin was even in Chicago for many years, and the Essanay Film Studio brought film production to Uptown. I never realized that St. Augustine College is the site of this former studio. Most people are familiar with the Green Mill Lounge as a legendary jazz club and hangout spot for Al Capone (apparently one of his guys owned it). I never noticed that if you look up at the wall above the restaurant next door, you can still see a carving of a mill to mark the spot. By the way, every Saturday at 3 pm, there’s a free live magazine show at Green Mill, Paper Machete. I definitely recommend checking it out! Down the block is the renowned Uptown Theater, which has been closed for 40+ years and struggling to find the $100 million funding to restore it to its former glory. Hopefully as the city invests more into the Uptown neighborhood as an arts and entertainment district, someone will take over the project. Most people have probably been to the Aragon – the last concert I saw there was Lorde. Although it’s an interesting line-up most of the time, typically fluctuating between Spanish acts and alternative shows. I didn’t realize how many different functions the Aragon has had over the years – it used to be called the Cheetah club for awhile (even the marquee read Cheetah), it was a rollerskating rink, a disco and of course hosted countless concerts. I’ve never been inside the Bridgeview Bank (formerly Uptown Bank) building, but it’s gorgeous inside. The ornate ceiling is pink and aqua, it still has an manual-operated elevator and its impressive lobby has old-school teller windows. Unfortunately, during our tour the main lobby was closed (it was a Saturday afternoon), so I could only sneak a shot through the gate. Along the tour, we also stopped by the Art Deco-inspired post office, the Riviera Theater and a humble branch of the Chicago Public Library. One of Uptown’s newest spots that I can’t wait to check out is Uptown Underground, which hosts everything from burlesque shows to live music and magic. Our tour started and ended at Shake, Rattle & Read, my favorite used bookstore. They also have vintage magazines and used records – which I haven’t even begun to explore yet now that I have my record player up and running. This time around I got a pic with owner Ric and my latest purchase (ok, technically I made Daniela buy it for me). Of course, what’s a tour of Uptown without stopping at Harold’s for some fried chicken? In addition to the chicken, I also recommend the mac & cheese bites and fried okra to balance out your meal.